Soup is a very comforting and satisfying meal. 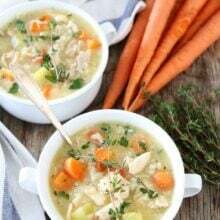 Soup can also be one of the healthiest and most enjoyable meals you eat if, you do it at home. 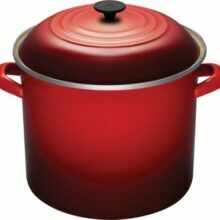 Most canned soups are high in sodium and fat, but when you make it yourself, you are “in charge” and can create a very healthy soup. I love making big batches of soup so we can enjoy leftovers during the week. I also like to freeze smaller portions for quick lunch or dinners when our schedules are busy. I made this mushroom barley soup on a snowy day and it really warmed my heart, soul, and stomach. Barley is a good source of fiber, selenium, phosphorus, copper and manganese. Barley makes this soup very hearty and will fill you up for hours. 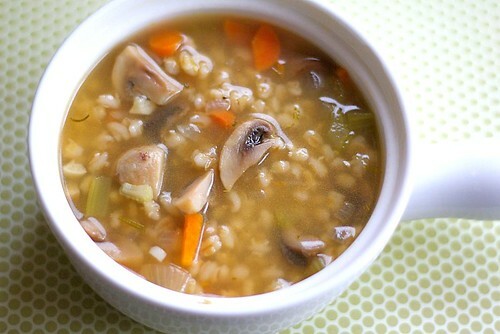 The simple broth and vegetables give the nutty barley the perfect amount of flavor. This soup will warm you up in an instant. Give it a try this winter. This healthy and hearty soup is easy to make and is perfect for a cold day! In a medium pan, bring 4 cups of water and the 1 cup of barley to a boil. Cover, reduce heat to medium-low, and simmer for 30-40 minutes, or until the barley is soft. You can make this the night before. Heat the olive oil in a large pot over medium heat. Add the onion and garlic. Cook until soft. Add the carrots and celery and cook until tender, about 5 minutes. Add the sliced mushrooms and cook until they are soft. Add the vegetable broth, water, bay leaves, and fresh thyme. Simmer for about 10 minutes. Stir in the cooked barley and cook for 15 minutes or so. Remove the bay leaves. before serving. Add salt and pepper to taste. Serve hot. This is one of my favorite kinds of soup and yours looks SO good! Now I’m very tempted to make some for lunch today. 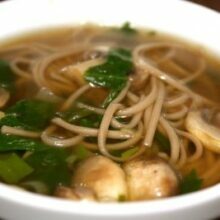 Sometimes I drizzle a little olive oil on my mushrooms and roast them before adding them to the soup. Adds a great flavor! I always forget about barley, and I have some, I just never think to use it. This looks great! I love soup this time of year. I love barley! My parents are obsessed with it too! I’ll send them this recipe! This would be welcome in my house today – heavy snow and freezing temps. Would be sure to warm us all up!! My mom used to make a mushroom barley soup when I was a kid and I had to force it down. Now it’s one of my favorites. Thanks for reminding me and for such a great recipe! 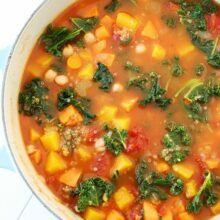 I just happen to have some barley in the cupboard – this soup looks hearty, healthy and delicious! A healthy soup! Great when it’s freezing cold outside! I just sat down last night and made a list of all the soups I want to make. I haven’t done it much in the past but it’s my new thing!!!!!! Yours look wonderful!!!! Soup make my tummy happy when it’s cold! This soup looks like the perfect meal! Sounds and looks yummy, Maria! I love making soups in the winter months! i have a feeling me and this soup could get along just great! That looks so rich and comforting! I love a nice big bowl of homemade soup… and if there is a loaf of freshly baked bread to go with it… even better! This is my kind of soup!! I can’t wait to give it a try! Looks great. I made a ridiculous amount of stock last week and it’s taking up space in my freezer. I need soup recipe inspiration wherever I can get it! I agree! Soup is so comforting! This looks so delicious! Yum! All of a sudden, I’m seeing barley and mushrooms all over the blogosphere. I love your recipe – nothing too fancy, and yet it sounds so comforting, warming, and hearty. So perfect for this frigid weather we’re having! So very true about the nourishing nature of soup. I also think that making soup at home is so very therapeutic! Haven’t done a mushroom barley soup in a long time. Thanks for the inspiration! barley is most definitely a magical soup ingredient. i just love how it plumps up and automatically makes the dish more hearty. lovely soup, maria! tis the season for lots of soup making isn’t it? I’m tired of winter already. I have a couple quarts of chicken soup in freezer, and seeing this made me defrost them. Could you please tell me if you could leave out the mushrooms?? My husband is NOT crazy about them. Shelia-if your husband hates mushrooms you can leave them out. I personally think they “make the soup” but I am a mushroom lover:) You can add other veggies if you wish or chicken or beans to make it more hearty without the mushrooms. I have been craving something simple and warming and I do think this would fit the bill. It looks heavenly! Yum! That soup looks fantastic! Thanks for sharing! 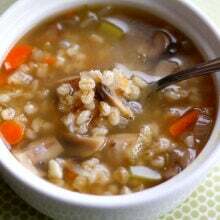 This mushroom barley soup looks so very good. Warming and satisfying! We are heading out to the mountains at the end of the month for a ski trip, I will make this while we are away (perhaps before then.) This would be the perfect soup for lunch or dinner, anytime!! Lovely photo! That really does look warm and delicious! Perfect for our weather! I luv soup to make, but my favorite is not so healthy made from lots of cream and milk! I’m definitely making this over the weekend. I have some barley and mushrooms I need to use up! Anything warm sounds good with this cold weather we are all having. Mushroom barley is one of our faves, delicious! Just wanted to let you know that I made it today and it’s great. I didn’t have bay leaf so I added a little poultry seasoning just to give it some more flavor. I’ll be hanging on to this one for sure. I make a beeg barley and veg soup but this is another great soup for barley…under-rated, healthy, filling and delish. I absolutely adore mushrooms. Will buy barely and whip this one up soon! Looks fabulous, I love barley! A delicious soup, pure comfort! Your soup looks fabulous Maria! I’ll have to give it a try this winter. What a comforting soup – wish I had a bowl right now! This is perfect! I’ve been looking for a soup recipe with barley that looks appealing. Definitely want to try this. Your soup looks really rich and nutritious. this looks REALLY REALLY good. i know barley is so healthy but i’m never quite sure what to do with it…i can tell your recipes are going to become faves of mine! I made your mushroom barley soup today (2-26-10) and it was absolutely out of this world delicious, it has now become my favorite soup. I can’t stay out of it so heaven help me. I have been looking for a barley mushroom soup ever since I tried one at a bowling alley restaurant during league bowling and that was several years ago and have never been able to find one that even measured up to the one i had at bowling alley (of all places huh?) until I made your recipe today. It is even better!!! Thank you so much for your fabulous recipe!! Chris-We are glad you enjoyed the soup. It is a good one, huh? Thanks for letting us know! I made some of this over the weekend for my freezer. Of course I had to sample it before freezing, and it is yummy. Thanks again for another fabulous recipe. the recipe looks great, but dont you think a recipe calling for a can of something is kind of dumb? what size can? how much liquid? why not just say X cup of liquid you can replace with stock if you wish? i never got that, and i see it on these sites all the time. c’mon people get a little professionalism going so the rest of us can actually USE these recipes! I updated the recipe. I used 15 ounce cans. I’m just greatful you shared the recipe. Tried and true. 🙂 made it. loved it. posted it on my blog and gave your recipe credit as it was by far the once i preferred with fresh veggies and ingredients. 🙂 thank you! I made this last week and it was wonderful! I had half a package of baby bellas to use up and found this recipe. I had some leftover rotisserie chicken so used 1-2 cups of that too. My husband and brother-in-law (who lives with us) fought over the leftovers! 🙂 Thanks for the great recipe! Thanks for letting us know! Glad you liked the soup! Just made this and it turned out great. I had everything but the mushrooms so I added ground beef. Delish! I’ve made this twice now and it’s just so good. I keep coming back to your recipe. You’re really a favorite here. Thank you! It should be fine on a very low simmer. You might need to add a little more liquid. What size (weight) pkg of mushrooms? 16 ounces. I updated the recipe. Thanks for catching that! Loved it/added dash of curry . This soup was just what I was looking for. Absolutely delicious!!! I had some barley to use up and this sounded great. It was. Just for fun I added one tablespoon of heavy cream. I love this recipe! The flavours are great together and you can add in other vegetables that you might have on hand. I added green beans and they added great colour and taste to this already wonderful soup! I have made it several times now. Found this recipe on Pinterest and have been itching to make it. Well, tonight was the night and WOW! It is SUPER delish. Even my husband raved about it, and he is a regular carnivore! He never missed the meat though, as this is so savory. It made a big pot so we will be eating on it for several days to come. Thank you for sharing this wonderful recipe. I have made this recipe several times and it’s one of my favorites! Delish! The only thing I do different is do are least 3 packages of baby Bella mushrooms, I do about 5 carrots and a little extra thyme and I double the barley. I love mushrooms and carrots . Thanks for the recipe very hearty soup. Has anyone tried cooking the barley right in the broth to save a step and a pot and infuse the barley with even more flavour? I’m hoping to make this today. Thanks for any help. I am making this soup now and I am not sure how many cups of liquid are correct. The recipe states one cup of water and 3 -15 oz cans of broth. The directions state to put 4 cups of water and 1 cup of barley in the pan and simmer. The discrepancy is 3 cups of water. I am trying to decide how to proceed. The water at the beginning is to cook the barley. For those gluten free, like my dad, I researched and found that coix seeds aka Job’s tears, is an excellent substitution for barley. I am not a fan of mushrooms, but I love barley soup. I tend to use more barley (Job’s tears) and add beef chuck roast chunks. I like the thicker stew like texture on a crisp winter day. Very nostalgic for me. I don’t see anybody who actually made the soup! We’ve did and it is great, except we thought the cup of water was too much, making the soup too thin. Could you comment whether the water was a typo? Otherwise it is very tasty and obviously healthy.